ELLNORA | The Guitar Festival has always celebrated the contributions of female artists on global guitar legacies. In April 2016 the University of Illinois’ Sousa Archives and Center for American Music acquired a truly one-of-a-kind electric guitar that was created in 1937 for Chicago’s Letritia Kandle. 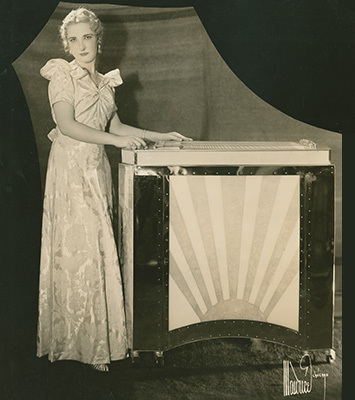 Illinois-based steel guitar collector/historian Paul Warnik generously donated Kandle’s Grand Letar as well as personal papers and photographs documenting her career as a leading Midwest steel guitar performer and teacher during the 1930s and 40s. The Grand Letar is a 26-string, five-necked instrument that has a one-piece fretboard with three six-string necks and two four-string necks. The instrument, which was built collaboratively by Kandle, her father Charles, and National Guitar, is tuned similarly to a piano and sits inside a cabinet covered in cast aluminum that features two 12-inch Lansing Field Coil speakers, a tube amp, and a dimmer (to light up its translucent fretboard and front panel, and change the colors of 120 bulbs as different tones are produced on the instrument). At 400 pounds, the Grand Letar doesn’t travel lightly, but it will be making its way across the University of Illinois campus for a special exhibit and lecture/demonstration during ELLNORA 2017. On Friday, September 15 at 1:15pm, audiences are invited to a free lecture/demonstration in the Foellinger Great Hall where Sousa Archivist Scott Schwartz will join Paul Warnik in conversation about the life and impact of Letritia Kandle, while T.C. Furlong will provide a demonstration of her signature instrument. Following the event, the Grand Letar will be moved to the Promenade gallery and store in Krannert Center’s Lobby where it and other materials from this unique music collection will be on display for the remainder of the festival.